During the Xbox @ GamesCom Livestream tonight the Xbox team announced the Xbox One X 'Project Scorpio' Limited Edition, and the Xbox One S 'Minecraft' Limited Edition themed consoles. Both are available for pre-order now. Among other topics NotebookCheck readers will likely welcome the news of extended support for Xbox and Windows 10 cross-play for select games. On Sunday evening in Germany, Microsoft's Xbox division ran a GamesCom Cologne (Köln) Livestream to show off the hardware and software they will be showcasing in their booth. NotebookCheck was watching, and we have summarised some of the key news here. In our opinion, Xbox One X 'Project Scorpio' was the headlining announcement, billed as the most powerful console with true 4k gaming support. Xbox One X pre-order is now open and starts with a Project Scorpio limited edition featuring Project Scorpio branding on the console and controller in addition to a custom printed exterior. Packaging is themed to look similar to the original Xbox console. Existing Xbox One controllers are compatible meaning you can use any custom controllers you have purchased. The Project Scorpio limited edition also includes a vertical stand. For those in Europe who want to experience the Xbox One X, there will be 70 playable units at GamesCom. The Xbox games library will include games which can take advantage of the extra performance of this new console. Microsoft Studio games such as Gears of War 4, Forza Horizon 3, Minecraft, Killer Instinct, Halo Wars 2, Halo 5, and Quantum Break will be retrospectively updated to true 4k and HDR for free to existing owners of each game. From now we can expect developers to release "Xbox one X Enhanced" games, from non-Microsoft studios who have been using the new dev-kit. A selection of these games are: FIFA 18, Star Wars Battlefront 2, PlayerUnknown's: Battlegrounds, NBA2K, Wolfenstein 2, Shadow of War, Titanfall 2, and Fallout 4. 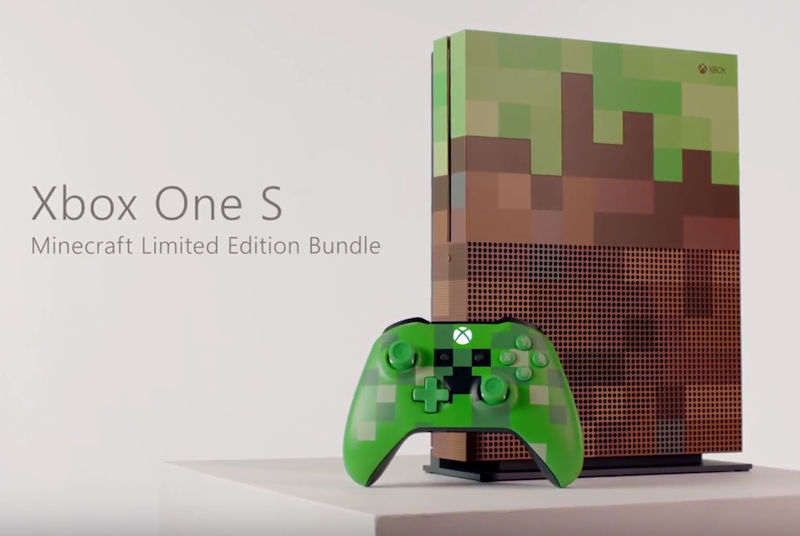 A second limited edition console was also showcased; The Xbox One S 'Minecraft' Limited Edition console, with pre-orders open now. This console is themed as a grass block, but for the first time on an Xbox, the back panel is transparent showing a Redstone circuit around the inside that lights up when the system is turned on. In the box is a creeper themed controller, but there is an optional pig theme controller for purchase separately. The console has custom Minecraft related sounds when turning on, inserting a CD and so forth. As part of the package deal there are custom skins and textures for the game. Microsoft is steadfast on cross-play between Xbox and Windows 10. Cross-play titles include Sea of Thieves, Forza Motorsport 7 (built from the ground up for PC - coming October 3rd for standard and deluxe or September 29th for ultimate edition), and the recently announced Rise of Nations (cross-play with Steam version). Xbox One backward compatibility is expanded to now include over 400 titles from Xbox 360 and the original Xbox. Xbox software enhancements to bring gamers together with features such as improved notifications when someone is streaming or pop-ups when friends put out a request for help in certain co-op games. Mixer Creator for iOS and Android (currently in beta), featuring the ability to watch live streaming by others and game stream your own mobile gameplay. Xbox Design Lab controller customisation expanded to include: Austria, Belgium, Bulgaria, Croatia, Cyprus, Czech Republic, Denmark, Estonia, Finland, Greece, Ireland, Italy, Latvia, Lithuania, Luxembourg, The Netherlands, Poland, Portugal, Romania, Slovakia, Slovenia, Spain, and Sweden. These are in addition to previously available countries (United States, Canada, United Kingdom, Germany, and France). Are you planning to pre-order either of these consoles and which feature are you most looking forward to? As a PC gamer I'm excited about cross-play, I believe it will be a good way to extend the community lifetime on games where the player base on each separate platform might not be large enough to maintain quality gameplay.